This is Heidi Peterson Barrett’s wine – yes, she of Screaming Eagle fame. Recipient of two 100 point wine scores from Robert Parker (if that kind of stuff is important to you), she has created many well-regarded wines since she graduated from UC Davis in 1980. The La Sirena is made in the northern Rhône style with Syrah from two vineyards in Calistoga and St. Helena. On the eyes, it’s a deep ruby and even at 7 years old, there is no garnet showing. Sediment shows in the bottle, so leave the last centimetre or you’ll be crunching on tasty bits. The nose is heavily perfumed with aromas of purple plum, field berry and deep garrigue. The palate is dry with high acidity, silky tannins and a graceful body. Flavours show deeply ripened plum and pomegranate, with black pepper, dried sage, tarragon and savoury meat. WSET Very Good Plus and delicious. Complex and layered, it has an extended finish and despite its alcohol approaching 15%, is an absolutely elegant drink. 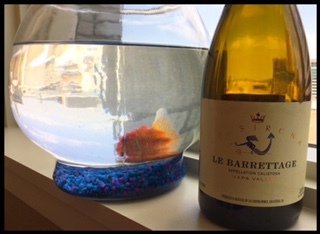 This entry was posted in California, OTHER, RED, Shiraz / Syrah and tagged california, Calistoga, Heidi Peterson Barrett, La Sirena, Le Barrettage, napa valley, red wine, Screaming Eagle. Bookmark the permalink. I love your site! We moved to Napa recently and are methodically working our way through the 500 wineries. This is another wine to add to our list. Check out our wine country blog at http://www.topochinesvino.com and follow us if you like what you see.